No. 4 seed Loyola (La.) def. No. 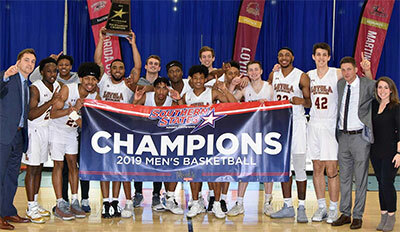 7 seed Middle Georgia State 78-74 to win the 2019 SSAC Men's Basketball Championship, presented by Newk's Eatery. With the win, the Wolf Pack earn an automatic bid to the 2019 NAIA National Championship. G: Elijah Staley (6'6''-G-96) of Dalton St.
G: Randy Bell (6'4''-G) of Dalton St.
PG: Matt Simpson (6'0''-PG) of Florida Coll. G: Aaron Burress (6'1''-G) of Dalton St.
G: Hayden Todd (6'2''-G) of Florida Coll. PG: Zach Brock (5'9''-PG) of Florida Coll. G: Sean Cranney (6'2''-G-97) of Dalton St.
G: Ty Pendley (6'1''-G) of Dalton St.